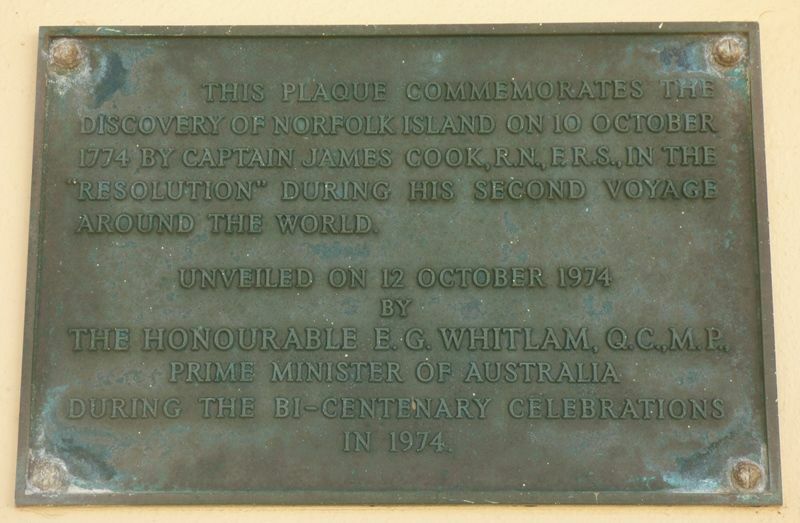 The plaque commemorates the discovery of Norfolk Island by Captain James Cook in October 1774. This plaque commemorates the discovery of Norfolk Island on 10 October 1774 by Captain James Cook, R.N., F.R.S., in the "Resolution" during his second voyage around the world. Unveiled on 12 October 1974 by the Honourable E. G. Whitlam, Q.C., M.P., Prime Minister of Australia during the Bi-Centenary Celebrations in 1974.